KARACHI: Cyclone Phet roared past Karachi and tore across the coastal belt of Sindh on Sunday evening after about a week-long, 1,100km journey from the central Arabian Sea. After lashing the Makran coast, the cyclone caused torrential rainfall in Karachi, Thatta, Badin, Hyderabad and adjoining areas and Met officials forecast that the rainy spell would continue at intervals till Tuesday. Widespread destruction of hutments of coastal communities by sea swell and gusty winds was reported by fishermen’s representatives who also expressed concern over lack of facilities in relief camps. They told Dawn that two boats with 15 fishermen had not yet returned to the coast. 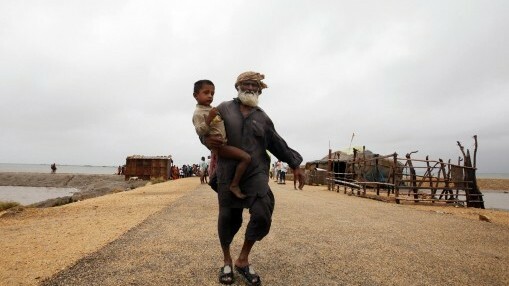 Tens of thousands of people living along the Balochistan and Sindh coasts had been relocated to safe places. The cyclone hit the coast between Karachi and Keti Bunder, blew away roofs and uprooted trees and electricity poles. It made landfall at Mirpur Sakro in Thatta. It rained heavily in Hyderabad. Intermittent rainfall was reported from Mirpurkhas, Sanghar, Naushahro Feroze, Moro, Mithiani, Kandiaro, Halani, Nawabshah, Dadu, Jamshoro, Mithi and Umerkot. Pakistan Meteorological Department’s Director-General Dr Qamaruz Zaman Chaudhry said the outer fringes of Phet, which had degraded to the lower side of a Category 1 cyclone, hit the Mirpur Sakro coast — 24.5N and 67.2E — southeast of Karachi at 9.30pm. He said the winds circulated anti-clockwise in a cyclone so it would be generating more sea surge on the eastern side than on the west (towards Karachi) from its landing place. He said Phet was expected to remain on the land in coastal areas for 12 to 24 hours during which it would lose much of its energy and convert in to a deep depression and then either dissipate or move further in the eastern direction and cross over to India. But it would not have much intensity left to cause any damage there. 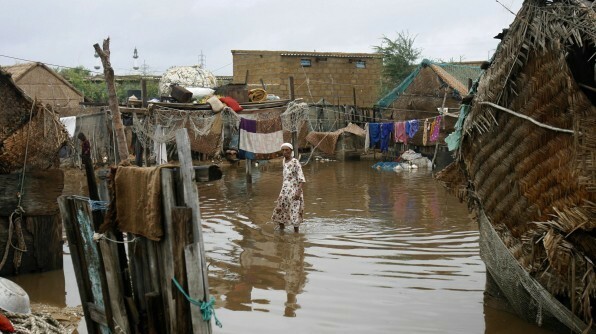 He said that although Phet had hit the land, heavy rains would lash Karachi and nearby coastal areas for another 24 to 48 hours that could cause flash floods in Sindh, including the provincial capital, and eastern Balochistan. Dr Chaudhry said Karachi received up to 150mm of rain on Sunday and Keti Bunder 69mm, Earlier Gwadar had received 370mm, Jiwani 208mm and Pasni 130mm. He said that Phet started as a deep depression in central Arabian Sea on May 31, moved northwards and intensified, converting into a very severe tropical storm, then curved westwards and hit Oman. After travelling overland it again started to re-curve eastwards and passing between the Omani and Pakistan coasts travelled on the sea while its effects caused very heavy rains along the Makran coast. It changed it direction several times, from Karachi, to east of Karachi, to the west, first gaining and then losing intensity. It finally hit east of Karachi as a tropical cyclone with very little intensity. The Met chief said fishermen could resume their activities west of Ormara on Monday. The heavy rains wreaked havoc in Karachi, crippling its infrastructure, submerging major traffic arteries and low-lying areas, disrupting power supply and snapping live wires which caused electrocution of seven people. Another person died when a carelessly driven speedy bus overturned on a slippery road. Pakistan Fisherfolk Forum’s chief Mohammad Ali Shah said Phet had hit the Thatta coast between Keti Bunder and Bhambhore. Its outer fringes touched the coast at around 7pm. He said at least 28 members of the fishing community were stuck in Khober creek and waited to be rescued. He said over 450 people from five villages of Kothi and Kar union councils had gone to Jati town on Sunday, but the administration was not allowing them into relief camps. He said efforts were being made to shift them to Sujawal.